This is an oversize square book, packaged in a beautifully textured hardback with the now familiar illustrations of Professor Astro Cat adorning the cover (we previously saw and loved him in Professor Astro Cat’s Frontiers of Space). The Atomic Adventure aims to explore the scientific laws of the Universe, ie, physics. Not only does the text pull in the reader, but it’s interactive too – suggesting experiments for the reader to partake in, (and not with a whole host of difficult ingredients, but simply and easily, such as measuring time with a stopwatch, and spraying a hose on a sunny day to make rainbows). One of my favourite pages is ‘The Man Behind the Cheese’. Not only does it explain the origin of the idea of atoms – but explains to the child that “It just goes to show that you can work out rather a lot just by thinking about things hard enough.” A lovely end to the tale of Democritus. 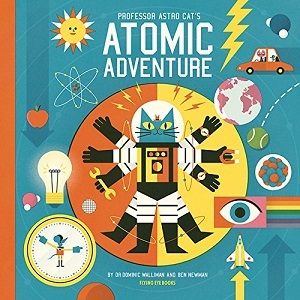 As well as particularly, from the illustrations – a combination of comics, diagrams, cartoons – Ben Newman has used many different ways to illustrate the various scientific concepts, with our Astro Cat but also Astro Mouse guiding the way. Great colour dynamics dominate the book, reflected in the blue, orange and yellow of the cover. It gives the book a distinctive look and flavour, but also manages to focus the mind when perusing the book – I was completely engrossed and lost inside it – my physics teacher would be proud. The design is elegant, well thought out, and perfectly executed. Delightfully, as in the previous space title, the book doesn’t purport to be the final frontier. In fact, it talks about things scientists are trying to do in the future, rather than wrapping it all up in the present. Yes, this means at some point the book will date, but seeing as all non-fiction books date at some point, it’s rather refreshing to have concrete speculation, such as the scientists using the idea of ridges in gecko feet to make amazing new materials, as well as working on lenses that never blur. Written by a quantum computer scientist, this appears to be an incredibly comprehensive and trustworthy title, with complex ideas explained simply, and importantly, in a fun way. Digestible, easy to decipher science and a push for the reader to keep reading and discovering. A perfect key stage two accompaniment to school physics, or a tool for home learning – it certainly enlightened this non-scientific reader. As I said, I’m no scientist, but one quibble as a reader is the order of the topics – it is surprising to me that gravity is the first page, but ‘forces’ aren’t introduced until much later. One reason may be the explanation that gravity is the reason the Earth was created – so there is some method to the order, I’m sure. My other quibble would be the lack of contents page (I’m a traditionalist), although I heartily approve of combining the glossary and the index. Something I’ve always thought was an excellent thing to do in non-fiction books for children. Highly recommended – you can buy it here.